Writing random articles, as ideas pop up in my mind. Lately I've been working on a code-only UICollectionView, and I've been experimenting a little bit with the self-sizing UICollectionViewCells. Needless to say, nightmares followed. Having been involved in Android development previously, it was never clear to me why UILabels behave the way they do – the default behavior being truncating – and not automatically create new lines without what's called Auto Layout. This was enough to create my label to look the way I wanted it, but... The time text was pretty close to the notification text. Except I wasn't. NSMutableParagraphStyle to the rescue, everyone. But how, I hear you asking. Well, the answer lies on another property of this type of object. Not lineSpacing, but lineHeightMultiple. By using this property, I only needed to know the range for the time text, which I could very easily determine. The actual line height is multiplied by the value you assign to the lineHeightMultiple attribute, so a value of 1.2 would actually raise the height of the line by 20%, giving me the result I wanted. The problem is that most of the times, you can fix this issue without doing dangerous things; disabling GateKeeper is never a solution, it's simply an ugly workaround. Anyways, this issue can sometimes be fixed with another command. Normally OSX (macOS) keeps track of file metadata, such as downloaded from. The metadata can be accessed through the xattr command line program. Next, I tried to open the app, and bam! The app loaded without a warning. So that's it! I started this blog as a way to post random thoughts on reverse-engineering and related stuff. However, I also do iOS development (Android development too, for that matter). Hence, this...short blog post. return "No bad boys allowed"
return "We can haz cheezburgerz"
We deserve a pat on the back for the hard work, except that we need to do, ahem...one last thing. Somehow we decide that it would be a great idea to include a special section for owls. Don't get me wrong though, not just any type of owl. Superb owls only. As if that made any difference. But I have even better news: market research has shown that our app would have much greater success if we placed cats first, followed by owls, and lastly dogs (sorry dogs, nothing personal). return "Don't call me, owl call you!" So by merely changing the values of each of the constants, we could easily reorder sections, without touching the data source and delegate methods. I hope this was an interesting read, and I really hope that this will prevent any (further?) headache to future developers who are just starting out. I've always been interested in getting into tweak development, but I've been busy doing other things, and I've also not had a jailbroken iPhone (sigh). A few days ago, I got my golden chance. It was a request on the r/jailbreak subreddit, asking for a tweak to enable browsing the filesystem using the Safari browser through the file:// protocol/scheme. I imagined it was a simple tweak to develop, which would be suitable for a first time tweak. Our mission is to grab the MobileSafari binary from our iDevice, and then find out where in the app this alert is triggered. We really need to talk about the prerequisites to following this tutorial. First of all, it is a no brainer that you need to know Objective-C. It follows that you also need to know a little bit of C. I'm not saying you should be able to write a compiler in C — you only need to understand the basics, and preferably be able to write a simple class in Objective-C.
Now, for this tutorial, you won't need to know ARM assembly — I know I don't (albeit I do have experience with x86 assembly). ARM assembly is a must if you wish to become a good mobile reverser, however. Also, you will need a disassembler. I'll be using a trial version of Hopper (https://hopperapp.com), but feel free to use what you have. Hex Rays (https://hex-rays.com) also offers IDA as a demo version which is known to work with 32 bit binaries (it doesn't work with 64 bit binaries). Next, you need to have Theos set up in your development environment. I won't go into the details of setting up Theos, but I might do so in another post. Lastly, you need to have a jailbroken iOS device, which I suppose you already do. Now let's load the binary in our disassembler. 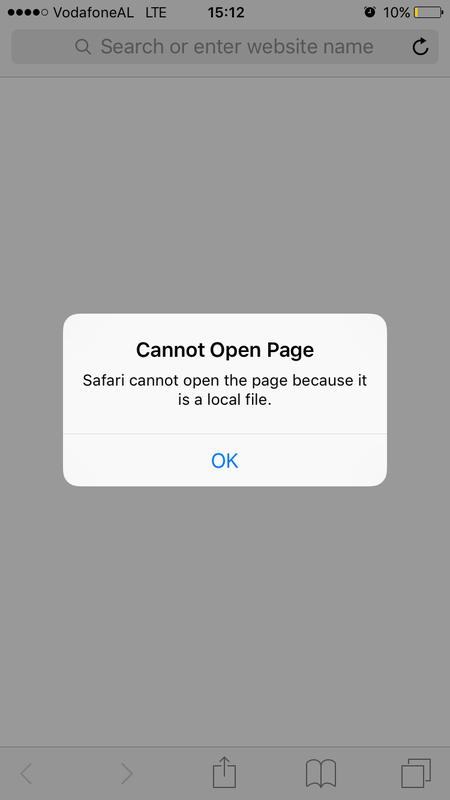 The first thing to do after loading the binary, is to search for the error string that Safari shows when we try to browse the filesystem. Hopper has a very nice user interface — it allows us to quickly search for a string within the binary, on its left pane. We search for the string "local file", and the first result in the list is actually the string we are looking for. So we go ahead and double click it — this takes us to the location of the string in the disassembly. Now that we found the string, we need to find the part of the code which accesses the string. Hopper is once again very useful: we click on the address (0x1001698ac), and then press the 'x' key. This shows us the list of the parts of the code which have references to the string we found. As we can see, there is only one reference to the string we found. We select the only result, and then click on the Go button. This will take us, in the disassembly, to the part of code which accesses our string. I know you might be puzzled about what this is. First of all, notice that there is a bunch of similar things, prefixed by the dq pseudo-instruction, which stands for declare-quad (word). We can see that between each line there is a difference of 0x10, or 16 bytes. So each line, or entry, is made of 16 bytes, or 4 words. Each word represents a thing. We are dealing with some sort of internal representation of strings. Each entry is made of the type, which for the string is ___CFConstantStringClassReference, a word which should be a bunch of flags for internal purposes which seems to be the same: 0x7c8 (I'm not sure about it, nor do we care), another word which is the actual address of the string literal (does 0x1001698ac ring a bell? ), and finally another word which seems to be the length of our string. Indeed, 0x37 is 55 in decimal, which just happens to be the length of the error string. Let's click on the address once again (0x1001911b0, it's highlighted in the screenshot above), and press 'x' once again. We get this nice popup once again, and this time we found our target. 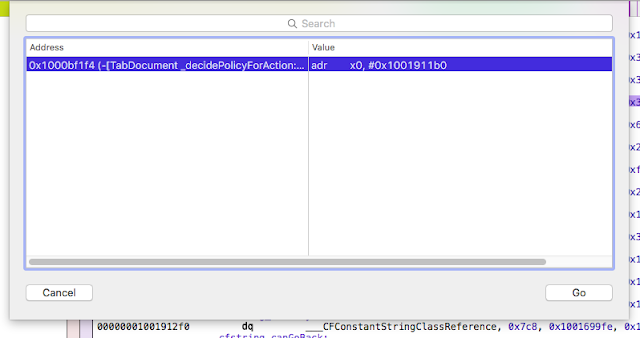 We can see that it is a method in the TabDocument class which starts with _decidePolicyForAction. Let's click on the Go button, and find out its full name. This time we will land on real code in the disassembly. What we need to do is scroll up until we see that "Beginning of Procedure" thing that Hopper nicely shows for us. There it is, in all its glory, the method which shows us that nasty popup when we try to browse our filesystem from Safari. This means we should hook onto this method, in order to defeat Safari and make it obey to us. 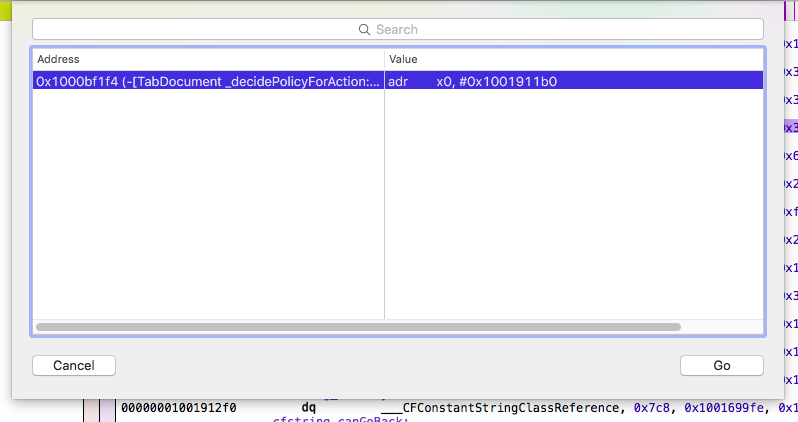 So our target method is _decidePolicyForAction:request:inMainFrame:forNewWindow:currentURLIsFileURL:decisionHandler: of the TabDocument class. But what should we do, specifically? So initially Theos asks you for the template. Here we enter 11, because we want to write a tweak. Next is the package name, which you can choose to change (recommended). Next it asks you for the author's name. This is the bundle filter for the process we are going to hook onto. We enter com.apple.mobilesafari, which is the bundle filter for the MobileSafari process. Here is the list of applications which should be terminated upon our tweak's installation, so that the tweak is loaded. We enter MobileSafari, because we want Safari to restart so that our tweak get's loaded. And, this is it. The tweak project is set up in the fileProto directory (or whatever the project name you chose was). The project directory structure is rather simple: there is control, which is just a text file containing meta-data about our tweak, Makefile, which is used by Theos in the build process, projectName.plist (in my case fileProto.plist), and also the Tweak.xm file. We will only play with the Tweak.xm file, where the source code of our tweak will reside. 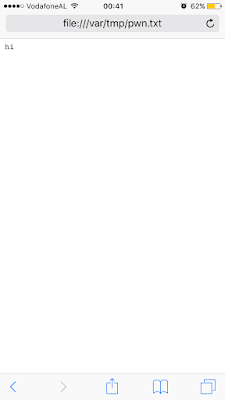 This file also contains some comments which help you when you're writing your first tweak. I know you can't wait to get your hands dirty, so let's learn just enough Logos for our purposes. Logos is the set of directives which we use in our tweak code to enable them to hook on methods we choose, and it looks pretty nice, too. The directives start with a % symbol, followed by the directive name. We are going to use only four directives: %hook, %orig and %log...%end. I placed %end intentionally where it belongs, in the end. Let's now see how these directives are used. The %hook directive is used to hook onto a specific class. So we create what is called a hook block, and we place all the methods we want to hook onto, inside this block. This will dump the headers of our MobileSafari binary into MobileSafari.h. Now we have some housecleaning to do. 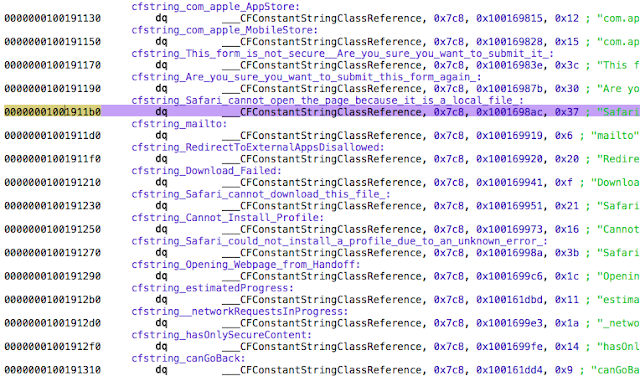 Open MobileSafari.h, and find the string @interface TabDocument. Now delete everything above this string. Now find the string @end. Delete everything below this string. Now we are left with the header of the TabDocument class only. But, we can take it further. Now feel free to rename MobileSafari.h into TabDocument.h, this way the header can be included automatically. Now we are going to use %log and %orig. %log is used to log all the parameters, whereas %orig is used to call the original version of the function we are hooked onto. Right now we are going to hook onto the method we found earlier, log all the arguments and then call the original function. This will compile our tweak, build the deb package inside the packages folder, and then install it into our device. 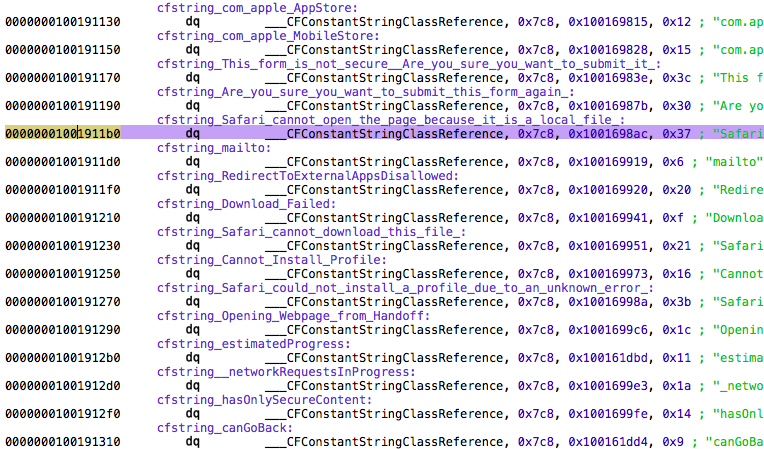 Next, we should open up Safari, browse to a URL like file:///test and then inspect syslog for the logged arguments. Here is a good article which explains how to read syslog on your iDevice. Something of interest in the log message is the request argument: there we can see that this is actually of type NSMutableURLRequest. Also, it is important to notice that currentURLIsFileURL has a value of 0, so it probably doesn't do what it looks like it does. My first thought was actually to set this argument to NO, but it was NO already, i.e. 0. We concluded the previous section with a brief note about two seemingly important arguments, where one argument was actually useless. Now, we could attempt to rewrite the whole method we hooked onto, but that would be too difficult: I promised we won't need ARM disassembling skills. Well, there is an easier way. By using our critical thinking skills, we can conclude that, since currentURLIsFileURL is useless, the only argument that has information about the URL being visited is the request argument. So, if we mess with that argument, and temporarily set the URL to a fake URL, perhaps we could get away with it and have a working tweak. Sounds like a plan. So we first save the original URL, and then we check if it starts with the file:// prefix. 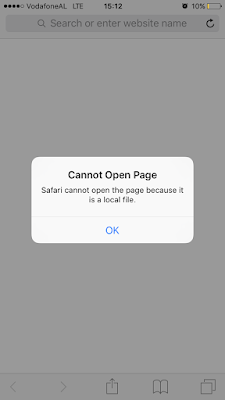 If so, we change the URL temporarily to google.com, so that the original function doesn't know we're actually trying to view a local file. Next we call the original function, and finally we restore the original URL if it was changed. This means our small tweak has done its job. You deserve to pat yourself on the back. We took a first look at tweak development with Theos. We saw how we can take a binary from our device and reverse it to find out more. We generated the headers, took a quick look at Logos, gathered information about the arguments of our target method, devised a simple strategy, and finally we developed our tweak. You can find the source code of the fileProto project in github. Note: the source code may be a little bit different from what we've presented here, but the idea remains the same. In this first post, we're going to exploit level 02 of Fusion from exploit-exercises.com. We will see how we can leverage a buffer overflow vulnerability, to find our way into the much desired shell. If you haven't already, download the fusion live cd ISO image, and boot it with Virtualbox or any other virtualization software you have. First of all, let's see the source code of the challenge, and point out a few important things. // maybe make bigger for inevitable xml-in-xml-in-xml ? printf("[-- encryption complete. please mention "
As we can see, it is indeed listening to port 20002. Let's now take a look at encrypt_file(). It is the landing function when connected to the host. Basically what the function does is, it has an a loop which initially accepts a single char, which can be either 'E' or 'Q'. 'Q' makes the function return, while 'E' is used to encrypt our data with the key the server has generated. If we choose to encrypt data, the server requires that we send an integer which is equal to the length of the plaintext, followed by the plaintext itself. nread() is used to read data from us, with the first parameter being 0, which stands for STDIN, the second parameter being the place where to store the value being read, and the third parameter being the size of the data to read. After the data is encrypted, the server will write to us back in a similar fashion the size of the encrypted data, followed by the data itself. nwrite() is used to write data back to us, with the only difference being that the first parameter is now 1, which stands for STDOUT. Then the loop restarts. The only function we haven't yet seen is cipher(). The cipher() function may seem a little daunting at first, but all it really does is, it xor encrypts our data with a randomly generated key. Moreover, the key doesn't change for the lifetime of the connection. The key is of type int, and it encrypts our data in blocks of 128 bytes. Time to talk about the fun part: the vulnerability. But, by now, you must've spotted the vulnerability. If not, please do not continue reading until you find out where the vulnerability is. So, as you have already noticed (you did follow my advice, didn't you?) 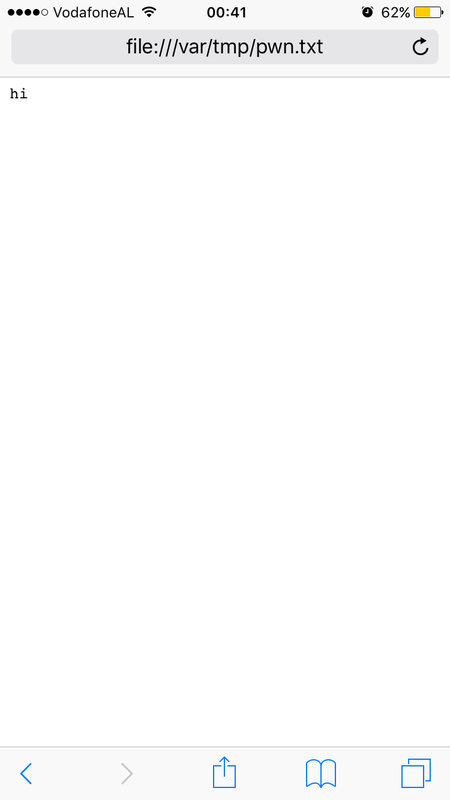 the vulnerability is that buffer has a size of 131072 bytes, but all nread() cares about is the size of the data we send to it, thus allowing us to overflow the buffer as we please. We have reviewed the source code of the vulnerable program, and we also showed why the program was vulnerable. Now we are going to exploit this vulnerability, by first doing the simplest thing you can do to a vulnerable program: crash it. To do this, we are going to overwrite the return address of the encrypt_file() function with an invalid address. However, we have just a minor obstacle in front of us. Sure enough, sending a sufficiently large plaintext to encrypt, will crash the server. However, we want to be able to alter the server's state in a meaningful way, thus we need to take account of the encryption. Let's just lay a little bit of foundation for the exploit we will be writing. welcome_message = "[-- Enterprise configuration file encryption service --]\n"
"""this function sends data for encryption to the server. returns the encrypted data"""
success_message = "[-- encryption complete. please mention 474bd3ad-c65b-47ab-b041-602047ab8792 to support staff to retrieve your file --]\n"
We wrote a set of functions which will help us to develop the exploit later on. The file descriptor is used instead of the socket in order to avoid calling recv() repeatedly when trying to read fixed length data. I know it is beginning to look like a really long journey, but believe me, we will soon get to the fun part. Now let's dive a little bit deeper into what happens when we send the data to encrypt to the server. Right after the server receives the data, a call to cipher() follows. By carefully inspecting cipher(), we can deduce that the function encrypts the buffer in place, then the same buffer is sent back to us. Also, remember that as long as we keep the same connection to the server, the encryption key will remain the same. Xor encryption is a very simple one. The way it works, makes it really easy to retrieve the original key if we have the plaintext and the ciphertext. Since we already have the plaintext, and we also get the ciphertext back when encrypting the data, we can easily retrieve the key. Let's now write the methods necessary to perform xor encryption and to retrieve the key. # isn't python a joy? There we have it. We wrote our xor encryption routine, and also a method to retrieve the encryption key. If A xor B = C, then A xor C = B, and also B xor C = A. So if we encrypt the encrypted data, we get back the original plaintext. Get it? If we encrypt the data before sending it, the cipher() function will actually decrypt the data, effectively leaving our original data in memory. So now we are free to own the EIP as we wish. We know that the buffer's size is 131072 bytes. So we need to add a few more bytes in order to enjoy our first victory. Let's write a method to do just that. So we wrote the crash_server() method, which takes the socket file descriptor and the encryption key, and sends a payload which should crash the server by setting EIP to a bogus address. We first send the data by calling the encrypt_data() method, then we send 'Q' to make the encrypt_file() function in the server return to our overwritten address. Let's see if 24 bytes are enough to overwrite the return address. Oh boy...it looks like the server crashed at EIP 0x45454545. If your ASCII is a little bit rusty, you can verify that 0x45 (or 69 decimal) belongs to the character E. So we can deduce that 16 bytes beyond the buffer, we start overwriting the return address. So far we have taken control of EIP, meaning we can make execution flow to an address we wish. But we have two protections to defeat: NX & ASLR. They work very well in conjuction, but the moment we beat ASLR, NX becomes pretty weak. We now get to the harder (and more fun) part of exploitation. In order to beat ASLR, we either have to bruteforce it (yuck! ), or find a way to leak a memory address which will then be used to find out other addresses of interest. The latter is what we are going to do now. In order to leak information from memory, we need a way to get that data to us. I hear what you are saying...the answer is nwrite(). This function reads from a specific address, and writes that data to us via the socket connection. But, what to read? Before we move on to read from an actually useful address, we are going to read the string "Enterprise" from the server, to make sure that things are working. In order to setup the exploit, we first need a few things. Let's load the level02 binary in gdb and find the address of nwrite() and the address of the "Enterprise" string. So we can see that nwrite() resides in address 0x80495a0. Now we need to find the address of the string "Enterprise". We know that the function encrypt_file() prints the welcome message when first called. So let's disassemble that function and see what we can find. Just at the top of the function, we can see a call to puts(). The source code shows that the code actually calls printf(), but maybe the compiler has optimized it to use puts() since it contains just a simple string and no formatting. So we have no choice but to see what is the value in the only parameter that is passed to puts(), that is 0x8049e04. $3 = 0x8049e04 "[-- Enterprise configuration file encryption service --]"
And sure enough, there is our warm welcoming message. So our welcoming message is at address 0x8049e04, but we want to get only the string "Enterprise", not the whole string. So the address we need is 0x8049e04 + 4, to skip the first 4 characters, which gives us 0x8049e08. So we know the address of the function we are going to call, we know the address of the data we are going to read (and its size), now we are missing only one piece of the puzzle: How? To answer that question, we need to take a look at how the stack is laid out when we crash the server with the proof-of-concept code we wrote above where we overwrote the return address with 0x45454545. So, in order to execute the nwrite() function, we need to write 4 values after overwriting the return address, in the reverse order in which they are pushed to the stack in the code snippet above. Armed with this information, let's change our Python script so that it tries to read the string we want. Alright, we have our code all set up. We do the usual connect() call, followed by the method that consumes the welcome message, next we retrieve the key, and we finally call our arbitrary read method. Since we have decided that nwrite() will return to 0xdeadbeef, it means that we should also check the logs to see if the server will crash at that address or not. Now let's run it. As expected, we have our controlled demolition right there, at 0xdeadbeef, as promised. Leak the address of a function from libc and use this address to compute the ASLR offset. Use the address above to deduce the address of execve(), and the address of the string "/bin/sh". So 0x804b388, which is the GOT entry for printf(), actually contains 0x8048876, which is the second instruction in the printf@plt() stub. The two other instructions of the stub, will basically call the resolver, which will resolve the real address of printf(), and also update its GOT entry, so that the next time it is accessed there will be the address of the printf() function. So, in order to leak the address of puts() in runtime, we need to read the value stored in 0x804b3b8. We theoretically solved the first step in our checklist (introduced in the section above), and we are now very close to getting to the shell. Let's first find out the addresses of execve() and "/bin/sh" relative to puts(). (gdb) find &system, &system+100000000, "/bin/sh"
warning: Unable to access target memory at 0xb7722f62, halting search. (gdb) find &system, &system+10000000, "/bin/sh"
So we first found the pid for level02, we attached gdb to the process, and now we will use the addresses we found to compute the offset from puts() for execve() and "/bin/sh". Our main method now calls the exploit method, and then we can see we use the interact() method of a Telnet object. Since the victim program's I/O is connected to the socket, and we expect to have executed the execve("/bin/sh", NULL, NULL) command, the shell should be listening for our commands from the socket. The Telnet object, given the socket, abstracts the boring stuff from us, and provides to us a simple interface to issue commands. As we can see, after running the script, it doesn't exit. Instead, it is waiting for us to input a command. We give the command id, and we get the uid, gid and groups with a value of 20002, meaning we have successfully exploited level02 and gained shell access. Congratulations! You can also find the exploit on GitHub. There are minor changes compared to the code in here, but the basics remain the same. I'd love to hear your thoughts on this.